The US is relying on a French aircraft carrier in Gulf operations because the UK currently lacks carrier capacity, according to reports. 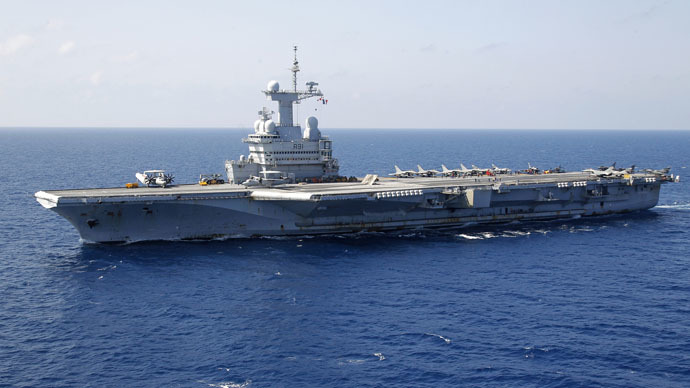 The French navy’s flagship – the aircraft carrier Charles De Gaulle – will fill the gap left when the USS Theodore Roosevelt ends its current tour with the Bahrain-based 5th Fleet in the autumn. The first of Britain’s two new Queen Elizabeth carriers is not expected to enter into service until 2017, and questions remain over whether or not the F-35 combat aircraft which are meant to operate from the ships will be available. Some military experts say the move reflects a British retreat from its global role that defines its so-called “special relationship” with the US. The US has increasingly aired its concerns about Britain’s military capacity and its willingness to tie itself to American global strategy, as it has done since the Second World War. News that the US will welcome the French warship, even as the American military continues its air war campaign over Iraq and Syria, comes just over a week after UK Chancellor George Osborne signaled he would press ahead with military budget cuts of £1 billion. The move could end Britain’s ability to meet the symbolic contribution of 2 percent of gross domestic product (GDP) required of NATO member states – a topic of debate in the run-up to last month’s general election. The issue has also been subject to repeated interventions by senior US figures, including President Barack Obama. The president is reported to have again pressured Cameron on spending at this weekend’s G7 summit of industrialized nations, stressing the importance of the UK and US as the “twin pillars” of NATO.